Cold Spring Harbor, NY – We think of the human immune system – for good reason – as our indispensable ally, our first line of defense against all kinds of invaders, including ones that can kill us if left unchecked. Yet in certain circumstances, cancer cells can turn the tables and make an enemy of our ally. A discovery published today in Science Translational Medicine by a research team at Cold Spring Harbor Laboratory (CSHL) underlines the point. It reveals how neutrophils, the most common type of white blood cell and enemy of bacteria and other invaders, can be "hijacked" by cancer cells and used as an aid in metastasis – the process in which cancer cells take up residence in organs beyond the original tumor site. The study also shows a possible way of preventing this. Associate Professor Mikala Egeblad and her team vividly demonstrate, using live-imaging technology, that a remarkable weapon sometimes deployed by neutrophils against invaders like bacteria and yeast can aid metastasis in a mouse model of triple-negative breast cancer, one of the most aggressive subtypes and known to be prone to spread and relapse in people. This astonishing weapon appropriated by cancer cells is a lattice of DNA, ejected from an activated neutrophil when the neutrophil detects a threat. Such nets — appropriately dubbed neutrophil extracellular traps or NETs — form dense spider web-like structures outside the neutrophil. The DNA that forms the backbone of the web is studded with tiny toxic enzymes that can degrade and digest invaders. 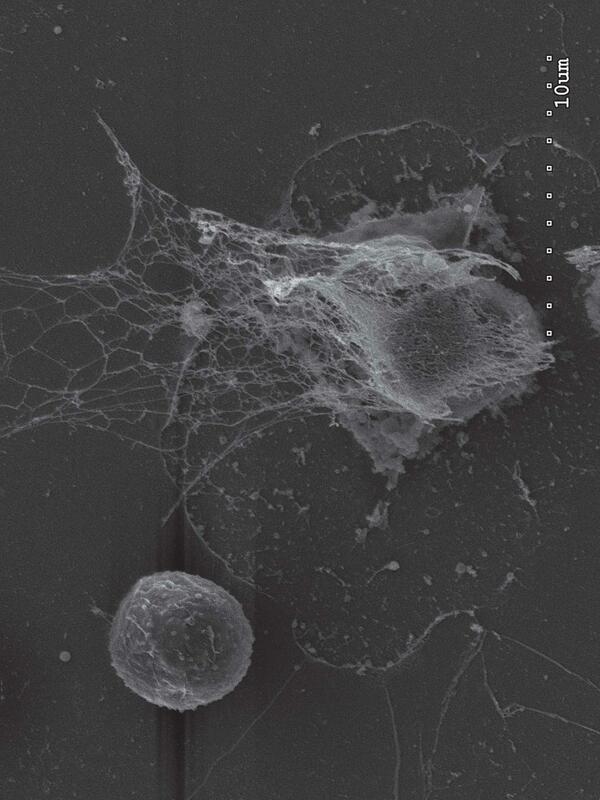 "The remarkable thing we witnessed in live imaging was the ability of cancer cells to induce nearby neutrophils to eject their NETs even when no infection or invader was present," says Egeblad. "Our experiments showed that the NETs, in such situations, can promote metastasis." Although the precise mechanism is still being explored, Egeblad thinks NETs help cancer cells by literally eating through the proteins that form a tissue's scaffolding – thus opening up small holes and crevices that cancer cells can occupy. This can be a first step in forming a cancer colony at a site distant from the primary tumor. Is it possible to prevent neutrophils from deploying their NETs? Doing so throughout the body would be an awful idea, since we depend on their killing action every day. But, says Egeblad, "you don't have to prevent it. You can degrade and digest the NETs as they are being formed." The team was inspired by a treatment used in cystic fibrosis, a disease in which the lungs cannot clear infections. Patients with cystic fibrosis are burdened, among other things, by innumerable deployed NETs, ejected from neutrophils trying to fight the persistent infections often occupying the patients' lungs. Patients can inhale a drug employing the enzyme DNAse, which cuts right through the NETs. As its name implies, DNAse will cut into anything made of DNA, as are the NETs sent out by neutrophils. "We are incredibly lucky to have the help of Dr. Michael Goldberg and his team at the Dana- Farber Cancer Center," says Egeblad. "We were explaining our discovery at a conference and mentioned that we were lacking a way to get DNAse to work inside tissues and Dr. Goldberg said he might be able to help." His team had developed a way to stabilize enzymes such as DNAse by "gluing" them to extremely tiny drug-delivery devices called nanoparticles that can be injected into humans. In this case, nanoparticles were not used as containers for a drug, but instead, as minuscule spherical objects coated with the drug, DNAse, so that it cutting effect would begin on contact with the NETs. Egeblad's team successfully tested the method in mice modeling triple-negative breast cancer, markedly reducing, and for some mice even preventing, metastases to the lung, the most common site of metastasis in this animal model. Since these experiments used the same formulation of DNAse that is used in an FDA-approved cystic fibrosis treatment, the way is clear to optimization of the system devised by Egeblad and Goldberg's teams. It will be very important, says Egeblad, to determine which breast cancer patients are most likely to benefit from such a treatment – presumably including those who have recently had an infection or who have undergone surgery and thus are at heightened infection risk. The optimal timing of drug delivery is also under study. Egeblad stresses that the work is also pertinent to current cancer treatments, since a neutrophil-boosting growth factor, called G-CSF, is given to many cancer patients during chemotherapy. That is because chemo is quick to kill white blood cells, a loss which can expose a patient to potentially lethal infections. Based on what they now know about the impact of neutrophils on metastasis, "it will be important to evaluate if this practice may actually be dangerous in some cases," Egeblad observes. Her team is studying this problem while it works on optimizing DNAse treatment to counter neutrophils when metastatic risk is high. The research described in this release was supported by: CSHL Cancer Center Support Grant 5P30CA045508; funds from the Department of Defense (W81XWH-14-1-0078); the Long Island 2-Day Walk to Fight Breast Cancer; the Joni Gladowsky Breast Cancer Foundation. Support was also provided by NIH (5U01CA180944-02); the Hope Foundation, the Cancer Research Institute CLIP grant; an NIHGM MSTP Training Award (T32-GM008444); Aid for Cancer Research; the Boehringer Ingelheim Fonds; Formación de Profesorado Universitario (FPU) fellowship (AP2010-2197); National Cancer Institute (K99 CA181490); and a DFG research fellowship (KU 3264/1-1). "Cancer cells induce metastasis-supporting neutrophil extracellular DNA traps" appears online October 19, 2016 in Science Translational Medicine. The authors are: Juwon Park, Robert W. Wysocki, Zohreh Amoozgar, Laura Maiorino, Miriam R. Fein, Julie Jorns, Anne F. Schott, Yumi Kinugasa-Katayama, Youngseok Lee, Nam H. Won, Elizabeth S. Nakasone, Stephen A. Hearn, Victoria Küttner, Jing Qiu, Ana S. Almeida, Naiara Perurena, Kai Kessenbrock, Michael S. Goldberg and Mikala Egeblad.